Once you make the decision to use natural stone in a construction project, it’s time to decide on the right mix of colors and styles. You may be accustomed to using one or perhaps two colors to cover a floor or wall, but you can get more creative than that. The fact is that most natural stones simply look stunning together, and combining multiple shades will give any home a fresh look that you’re sure to love. Here are just a few ideas and combinations that you might want to consider for your next custom project. If you have a large kitchen that can feel cavernous, then a deep color on the walls is a good choice to help make the room more intimate and welcoming. Rather than going with a simple painted backsplash, make it more attractive by turning it into a stunning shade of red that’s natural, inviting, and warm. Rojo Alicante is a natural marble that features a red background broken up by shades of brown and white veins. It adds some visual movement to a room while making it more appealing. 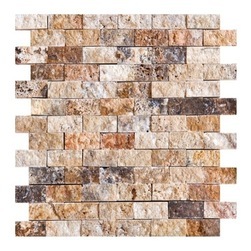 This makes an excellent accent tile with most color schemes, but it’s particularly attractive when placed next to the soft brown shades of Adalia Cappuccino. Use the cream, brown, and dark yellow marble in your countertops and even floors, but allow the deeper red shades to offset the walls in a beautiful manner. Coral stone tiles and shell reef limestone both have a rough finish that makes them appropriate for use around the pool deck and in your outdoor kitchen. They’re ideal for patios, front porches and walkways. However, you may not settle for the pure white of shell reef or the subtle tan shades found in coral stone. A better option is to mix the colors for a delicate pattern that will impress your guests. Go with a checkerboard look, or install them in a random pattern for something more whimsical. Another popular option is to install the tan coral stone in the center of a pathway with the shell reef creating a stunning border that highlights the space. Regardless of the pattern you create, you’ll love how the two colors work together to add interest and visual appeal to the space. If you love the black and white patterns that you see in some restrooms, restaurants and even hotel lobbies, then you’ll be thrilled to know that you can create it at home with natural stones. While many commercial places may use ceramic to get the look, you can bring it to your personal space with vanilla oro marble tiles and sleek, black granite. Vanilla oro features a white to ivory color that has some gray in it, but it’s very close to a pure white. Mixed with a pure black granite that has little variation of color, you’re sure to create a look that will take your home to the next level and help set it apart from the neighbors. Add three different colors to your bathroom in a tasteful and effective manner that you’ll never grow tired of. These three stones feature shades of beige and mocha in different intensities. The crema marfil marble has the lightest coloring with a consistent ivory background, and saturnia ivory travertine features slightly darker shades of ivory with lighter shades moving through it. Finally, the crema river is the darkest of the lot with heavier shades of brown. Install this collection in your bathroom. Use the darkest color on the floor, and offset it with the lightest color as baseboard and countertop. The saturnia makes a stunning wall covering in the shower, and then you can use it as an accent color around the mirrors, window, and even as a chair rail. The colors work beautifully together, yet they’re close enough in shade that the contrast will never be distracting or overwhelming. With neutral shading, you can rest assured that your décor will always match regardless of how often you change it. Another option is to go with two stones that feature drastically different veining patterns. Bianco dolomiti and Arizona ivory travertine both feature light colors of white and ivory, but the natural patterns stand apart from each other. Where the bianco dolomiti features sleek grey lines that are reasonably straight, the travertine has more movement with heavier shading of brown and more contrast. Use one on the kitchen counters and the other for your floor for an attractive look that will match every type of décor. The colors look amazing together, but you’ll have enough variance that the space won’t feel overwhelmed. Make the shades stand out even more by going with wood cabinets in a contrasting color and adding bolder shades to the walls. When you’re ready to purchase natural stone tiles, work with a supplier that offers wholesale pricing and phenomenal customer service. The professionals at Nalboor can help you determine which colors are right for your project, and we’re happy to help you place an order. We sell high-quality stones that are cut by skilled manufacturers so they’re less prone to cracking and other damage. We fill orders promptly, and we’re able to ship to locations throughout the United States. We take steps to control our costs throughout the manufacturing and delivery process, and we pass those savings on to you through wholesale pricing that you can count on. Whether you’re placing a small order for your own use or refilling the inventory for your contracting business, we’re here to help you. Contact Nalboor today to discuss your needs and place an order for contrasting or coordinating natural stones. We take pride in our great service, and we hope you’ll appreciate our focus on customer satisfaction.